This Fourth of July holiday weekend may be one of the deadliest on our nation’s roadways according to a recent forecast from the National Safety Council – and due to the fact that this year’s holiday arrives at the end of a long weekend, Maryland officials are preparing for a possible increase in impaired driving compared to previous years. 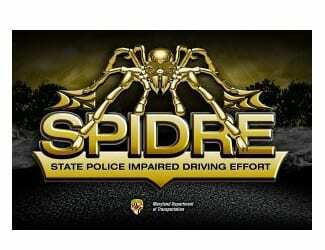 To combat this increase and save lives, Maryland Department of Transportation officials today joined with the Maryland State Police (MSP) to highlight their successful partnership to target drunk and drugged drivers through a law enforcement initiative known as the State Police Impaired DRiving Effort, or SPIDRE. This elite MSP team uses crash data to target and remove impaired drivers from Maryland roadways. Over the past five years, impaired drivers have accounted for roughly one third of all roadway deaths in Maryland. On average, there are 7,884 impaired driving crashes statewide, resulting in 4,026 injuries and 171 fatalities every year. Over the course of the next year, Maryland will spend approximately $4 million in federal funds to save lives by preventing impaired driving. As a part of that effort, Maryland has provided approximately $1.5 million in federal funding to the MSP to pay for the SPIDRE team. Since its launch in 2013, the SPIDRE team has been responsible for nearly 5,400 traffic stops, resulting in 1,872 DUI arrests. In addition, more than 110 arrests have been made for criminal and drug-related offenses. In addition to investing millions in targeted law enforcement strategies aimed at catching and arresting impaired drivers, the Hogan administration also is focused on ways to enhance roadway safety and fix all structurally deficient state-owned bridges. Governor Larry Hogan has allocated nearly $2 billion in additional highway funds targeted to long-awaited improvements throughout the state. $152 million to widen a nine-mile stretch of MD 32. Plan a safe ride home before the fun begins. Designate a sober driver or use public transportation to get home safely. Use Maryland’s ENDUI (End-DUI) app, which is free at the iTunes and Google Play stores. ENDUI is an educational tool that allows a user to find transportation options and estimate their blood alcohol concentration based upon drinks consumed. If you see a drunk driver on the road, don’t hesitate to contact your local law enforcement agency by dialing 911. If you know people who are about to drive after drinking, take their keys and help them make other arrangements to get to where they are going safely.